We’ve got some chest, shoulders, and triceps action to take a look at, so, without further ado. Pre-Workout: 24oz of Gatorade, 20g of Whey Isolate, 1g of Kre-Alkalyn Creatine. Intra-Workout: 36oz of Gatorade mixed with a serving of Modern BCAA that has a profile of 8:1:1, and another shaker that contains 40g of Whey Isolate. The first compound sets are done in the style of the 5/3/1 program, with the weight based on a percentage of my max lift. 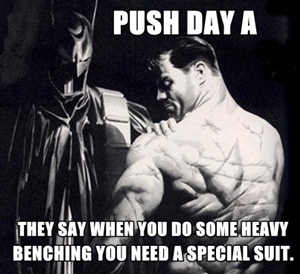 The first week it’s 65, 75, and 85% of your max, in sets of 5. However, on the final set you do as many as possible. The second week it’s 70, 80, and 90 all sets for 3, again, except for the final one. Finally, the 3rd week is 75, 85, 95, with the sets going 5, 3, 1. 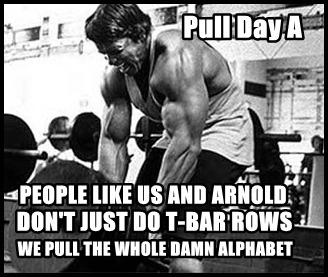 Then the 4th week is a deload week, with all sets at just 5 reps, and the percentage real low, such as 40, 50, and 60. I usually rest 2-3 minutes when things get heavy. With the following compound hypertrophy based lifts, they’re on a 3 month schedule. During the first month they’re done at 50% of my max, and I rest at the absolute most 60 seconds. The second month is 60% of your training max, and the 3rd month is 70%, then you start all over with your higher maxes, of course. That much volume with such little rest gives you a great pump and wears you out pretty well. The following sets that are 3 sets of 12-15, as I go for the pump. I only rest 30 seconds, and just look to burn things out. I felt really good here. I was doing pause reps for the first two sets, to really help warm me up for the big set. The rep amount is set at 3 for the final set, but you’re suppose to nab as many as possible. I really wanted 6, because I’d never hit 6 before at 245lb. I was damn happy to nail it, and honestly, I think if I really pushed it, I may have nabbed 7. However, there’s no point in risking injury, as I’m more than happy with a PR of 6 at 245lb for now. One of my all time favorites. Few things better than some OHP for 5 sets of 10, baby. For these, I honestly recommending advancing 5lbs once a month, maybe even once every two months. This is that machine that takes a bit of weight off you to help those who can’t do bodyweight dips or pull-ups. I can do bodyweight dips, just not full sets of 10. Plus, 269lb is harsh on my wrists. Of all the Fly variations, this is easily my favorite. I just get a deeper contraction, a greater pump, and a better feel. I set the attachment low and wide, then bring them upward in front of my face, like a double, sweeping uppercut, and squeeze. I’ve got a video coming out soon that’ll show these. Basically, you stand to the side of a weight stack with a handle attachment up top. You grab it, and twist your hand while bringing your forearm down across your body. It really works your outer triceps to give you a wider look. An arm only gets rest whilst the other is working. The absolute best way to do these bad-boys. Do them on the end of a bench, not the small chair that supports your back. It works my delts & traps much deeper than standing. Post-Workout: 1g of Kre-Alkalyn Creatine, 20 minutes later I have 30g of Whey Isolate. As you can see in the image for today, we’ve got our boy, Batman. 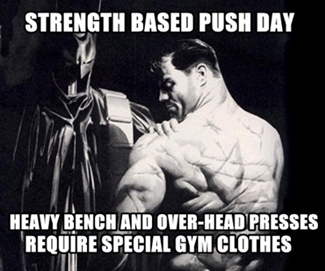 I’m in the midst of currently writing up what I believe Batman’s workout would be. 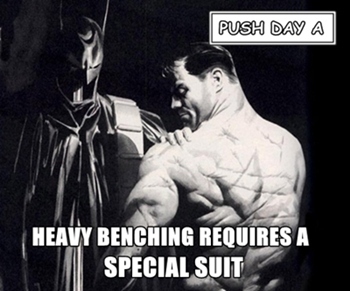 It’s pretty heavy duty, because Batman never slouched on anything, and I’d like to see someone give it a shot once finished. Until then, let’s get on with today’s action. Not much to say here in the preamble, so let’s hop on the good foot, baby. Before we get to the action, got a brand new Top 5 list for you, the beautiful people. As always, I hooked up with some friends at 411, and we talked about our Top 5 Stephen King films. Dig it. Brand new podcast ep over at Mercy Is For The Weak, so, check out the new hotness while we go over today’s workout. New videos coming right soon. As you can see, I’ve started a new workout, but I’m updating late and want to get to bed, so I’ll fill you guys in on it tomorrow. Until then, check out this week’s Man Movie Encyclopedia, as we head into the high seas with Seagal for Under Siege.